EXTREMELY FINE AND STUNNING SHOWPIECE. 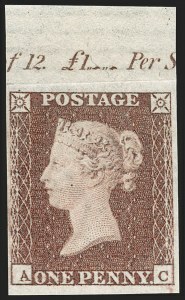 A REMARKABLE PLATE NUMBER BLOCK OF THE ONE-PENNY RED BROWN PRINTED FROM THE "BLACK PLATES". Blocks from the "Black Plates" are quite elusive, but do exist. 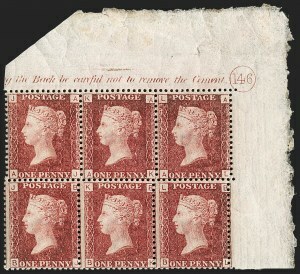 Plate number blocks, on the other hand, are major rarities, especially in such choice condition. FINE-VERY FINE. 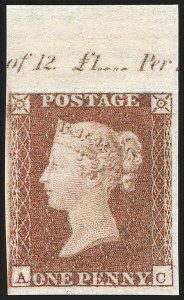 AN IMPRESSIVE SIZED MULTIPLE OF THE ONE-PENNY RED BROWN FROM PLATE 74. THERE ARE VERY FEW MULTIPLES LARGER THAN THE BLOCK OFFERED HERE. According to records, Plate 74 was registered on Jan. 14, 1847. Ex Baillie. EXTREMELY FINE APPEARANCE. 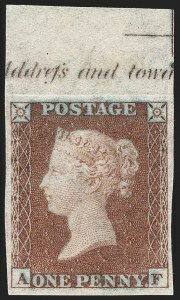 A MAGNIFICENT SHOWPIECE MULTIPLE OF THE IMPERFORATE ONE-PENNY FROM PLATE 22, USING THE EXPERIMENTAL NEALE'S STEAM PRESS. ONE OF THE LARGEST KNOWN BLOCKS FROM THE ONE SHEET DISCOVERED. Reports show that Plate 22 was put to press on Aug. 1, 1855, using the experimental Neale's Steam Press. The same occurred for Plate 25 at a slightly later date. The Neale's Press was a revolutionary machine that automated plate inking, wiping, polishing and paper feeding at a greater speed than before. 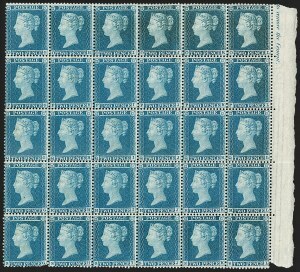 It is believed that one sheet each from both Plate 22 and 25 were discovered around 1960 and ultimately cut up to feed collector demand. It is presumed that the remaining 2,000 sheets printed from Plate 22 using this process were destroyed. FINE-VERY FINE. 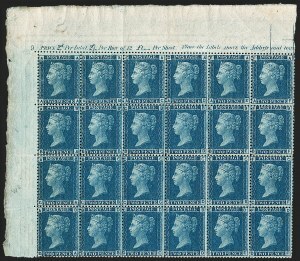 A SPECTACULAR LARGE MULTIPLE OF THE 1849 2-PENCE PALE BLUE FROM PLATE 4. THIS IS BELIEVED TO BE THE LARGEST UNUSED MULTIPLE IN PRIVATE HANDS. 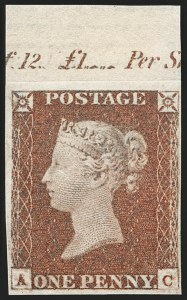 Blocks of this issue in any size are rare, as evidenced by the large difference in the SG Specialised catalogue value for a block versus four singles. 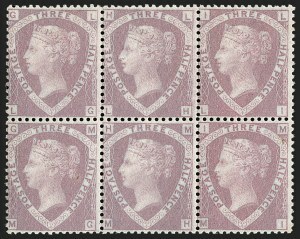 A review of major Great Britain collections containing early Line-Engraved multiples located blocks of four, six or even nine, but nothing of the magnitude of this block for any of the plates used for the White Lines Added issue. Ex Adams, Griffiths and Baillie. SG as eight blocks of four and two pairs of the cheapest shade (Blue) is £436,000. 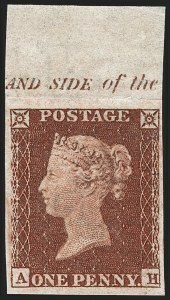 EXTREMELY FINE ORIGINAL-GUM EXAMPLE OF THE 1841 2-PENCE FROM PLATE 4. 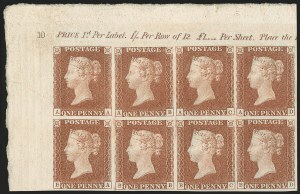 VERY FINE AND STUNNING MULTIPLE OF THE 2-PENCE PERFORATED 14 FROM PLATE 5. 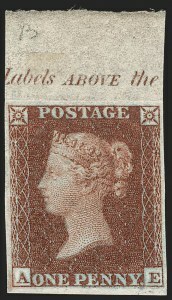 THIS IS THE LARGEST RECORDED MULTIPLE OF THE ISSUE AND AN IMPORTANT PIECE FOR ANY LINE-ENGRAVED COLLECTOR OR EXHIBITOR. Ex Fraser and Baillie. With 1983 B.P.A. certificate (not noting any faults). SG as six hinged blocks of four and six hinged singles £111,000, which only hints at the spectacularly rare nature of this multiple. EXTREMELY FINE. 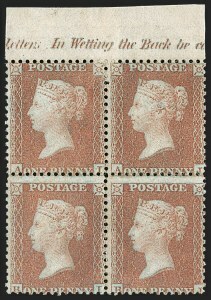 AN ABSOLUTELY REMARKABLE ASSEMBLAGE OF IMPRIMATURS OF THE 1864 ONE-PENNY RED. 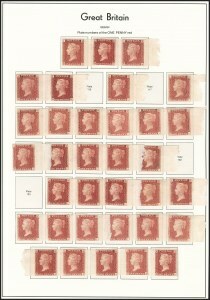 THIS COLLECTION ACCOUNTS FOR NEARLY 80% OF THE PLATE POSITIONS -- EACH AS A GEM SINGLE WITH SHEET-MARGIN. WITHOUT QUESTION THIS COLLECTION WOULD BE NEARLY IMPOSSIBLE TO REPLICATE. Imprimaturs from Plates 71-225 are known with the exception of 75, 77, 126, 128 and 158. Ex Gross. SG £50,575. FINE-VERY FINE. 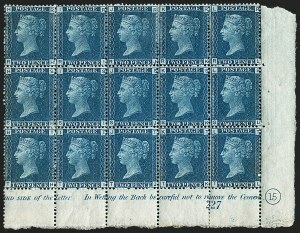 AN IMPRESSIVE MULTIPLE OF THE IMPERFORATE ONE-PENNY FROM PLATE 121 ON DR. PERKINS BLUED PAPER. This trial paper supplied by Dr. Perkins was chemically treated, causing the slightly blued hue, in order to prevent the removal of cancels. 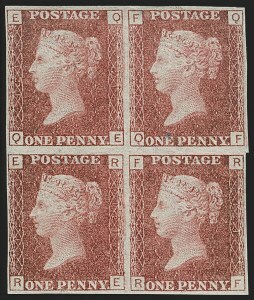 A few sheets were used to print the 1p Lake Red from Plate 121, 2p Blue from Plates 9 and 13 and the 1-1/2p Lake Red from Plate 1. Multiples of any size are seldom encountered. Ex Baillie. With 1983 R.P.S. certificate. SG as singles £26,000. VERY FINE. 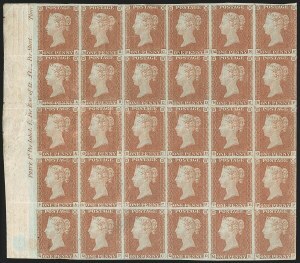 AN EXCEPTIONAL SHOWPIECE BLOCK OF 24 OF THE 2-PENCE FROM PLATE 9. RARELY ENCOUNTERED IN A MULTIPLE OF THIS SIZE. 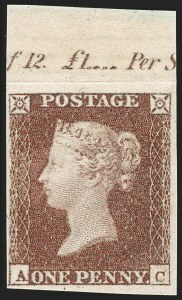 It is interesting to note the selvage inscription of this block for a price of the sheet versus the 1p stamp. The traditional form of currency was 12p per shilling and 20sh per pound, making 240 pence per pound. 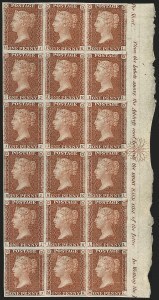 Sheet inscriptions on the 1p state a sheet cost £1 which is 240 stamps. On the 2p, which is shown here, a sheet costs £1 as well, which is 120 stamps. 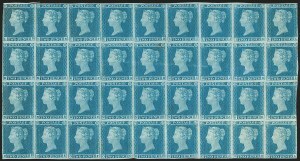 Therefore, the sheets were printed in the 240 stamp format and cut into two panes prior to having been sold at the post office. 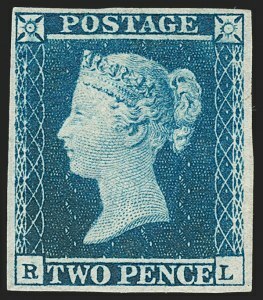 VERY FINE AND HANDSOME PLATE NUMBER BLOCK OF THE 2-PENCE DEEP BLUE FROM PLATE 15. A VISUALLY STRIKING LINE-ENGRAVED MULTIPLE. VERY FINE. 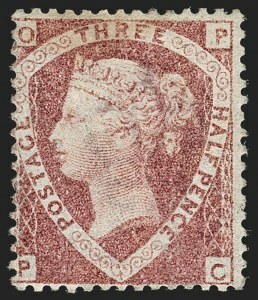 A RARE LARGE-SIZED MULTIPLE OF THE HALF-PENNY ROSE, ADDITIONALLY WITH THE IMPERFORATE BETWEEN STAMP AND MARGIN AT RIGHT, IN A PERFECT STATE OF PRESERVATION. Ex Baillie. With 1982 B.P.A. certificate. 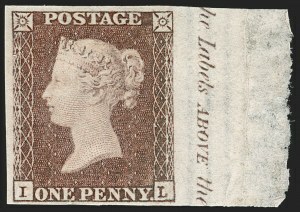 VERY FINE BLOCK OF THE UNISSUED 1860 1-1/2-PENNY ROSY MAUVE. AN IMMENSE RARITY OF THE LINE-ENGRAVED PERIOD AND THE LARGEST KNOWN MULTIPLE IN PRIVATE HANDS. 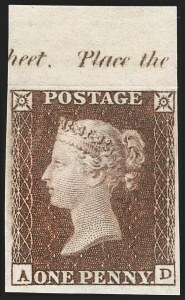 This stamp was printed and prepared for use in 1860 in anticipation of a change in postal rates. Changes did not come to fruition, but some 10,000 sheets were already printed. Most of the supply was destroyed and it is unknown how or why unused examples managed to get out with three or four even postally used. Postal changes did occur about a decade later in 1870, whereby SG Nos. 51/52 were issued using the same plates. A block of six is the largest recorded multiple known in private hands. We are aware of only two other blocks of six - D-J to E-L (ex Beresford) and R-F to S-H. It goes without saying that multiples of any size are extraordinarily rare. Ex Adams and Baillie. With 2005 B.P.A. certificate. Catalogued simply as hinged singles. SG £51,000. Scott $52,500.00. FINE AND IMMENSELY RARE UNUSED EXAMPLE OF THE OP-PC FOR CP-PC ERROR OF LETTERING. ONE OF THE SMALL HANDFUL OF ORIGINAL-GUM EXAMPLES IN EXISTENCE. This is the most significant and visually constant error of Great Britain Queen Victoria stamps. This error occurred on all printings from Plate 1. Remarkably, the error went unnoticed during the four years of printing runs. In 1894 it was mentioned in an American journal, 24 years after release. Ex Seymour and Baillie. With 1989 R.P.S. certificate. SG £30,000. Listed but unpriced in Scott.